It would not be fair to blame yesterday’s disasters in Egypt and Libya entirely on Barack Obama’s failed Middle East policies. The Muslim extremists who attacked our embassy and consulate are alone responsible for their actions; they are, as a former president memorably put it, evildoers. Nothing we say about American foreign policy excuses them to the slightest degree. It is nevertheless true that what happened yesterday in Egypt and Libya is directly related to the perverse policies that the Obama administration has followed for the past four years. Obama’s policies in the region are inconsistent, and Obama himself has never tried to reconcile them. He insisted that Hosni Mubarak must go, even though Mubarak was America’s best friend among Arab leaders. Mubarak himself held Obama largely responsible for his downfall. If Mubarak were still in power, yesterday’s outrages in Cairo, which were led by al Qaeda members or sympathizers, would not have occurred. Obama eagerly lent American military power to the overthrow of Muammar Gaddafi in Libya. Unlike Mubarak, Gaddafi was no friend of the United States. But he had abandoned his support for terrorism and his quest for weapons of mass destruction. Still, he had to go; because of the humanitarian crisis, Obama told us. If Gaddafi were still in power, yesterday’s attack in Benghazi, which was also carried out by al Qaeda members or sympathizers celebrating the anniversary of September 11, would not have happened. Then there is Syria, which is headed by a dictator who is bitterly hostile to the U.S. and is Iran’s principal regional ally. The humanitarian crisis in Syria is far worse than anything that happened in Libya. Yet the Obama administration sits on the sidelines. And let’s not forget Iraq. Poor George Bush must feel left out; where was the Arab Spring when he needed it? Barack Obama and many other Democrats, including members of his current foreign policy team, bitterly opposed the Iraq war on the grounds that it is illegal to overthrow a sovereign nation’s government, and you can’t impose democracy by force. Hey, tell it to the Libyans! 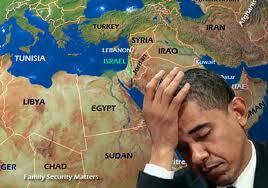 What does Obama think he is doing in the Middle East? Unlike George Bush, who gave a series of excellent speeches outlining his strategies in the region, he has never said. I suspect that he doesn’t really know or, frankly, care very much. You could call his actions in the region incoherent, except that it’s worse than that, especially if you take into account his hostility toward Israel. If a consistent principle can be deduced, it is that Obama wants to avoid doing anything that might advance U.S. interests. Maybe that’s the answer, or maybe he just doesn’t care enough to formulate a real policy. Be that as it may, one thing is clear: but for Obama’s feckless participation in the overthrow of Egypt’s and Libya’s governments, yesterday’s events would not have happened. It will be interesting to see whether reporters ask Obama hard questions about the fruits of his policies, or whether they instead follow the newly-discovered rule that foreign policy is not to be discussed during an election year. God Bless America? No, Please Don't!